Before Everything is a celebration of friendship and love between a group of women who have known each another since they were girls. They’ve faced everything together, from youthful sprees and scrapes to mid-life turning points. Now, as Anna, the group’s trailblazer and brightest spark, enters hospice, they gather to do what they’ve always done—talk and laugh and help each other make choices and plans, this time in Anna’s rural Massachusetts home. Helen, Anna’s best friend and a celebrated painter, is about to remarry. The others face their own challenges—Caroline with her sister’s mental health crisis; Molly with a teenage daughter’s rebellion; Ming with her law practice—dilemmas with kids and work and love. Before Everything is as funny as it is bittersweet, as the friends revel in the hilarious mistakes they’ve seen one another through, the secrets kept, and adventures shared. But now all sense of time has shifted, and the pattern of their lives together takes on new meaning. The novel offers a brilliant, emotionally charged portrait, deftly conveying the sweep of time over everyday lives, and showing how even in difficult endings, gifts can unfold. Above all it is an ode to friendship, and to how one person shapes the journeys of those around her. 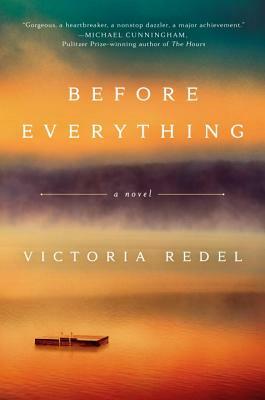 Victoria Redel is the critically acclaimed author of four previous works of fiction and three collections of poetry. Her debut novel, Loverboy, was named one of the best books of the year by the Los Angeles Times and won the Sister Mariella Gable Prize from Graywolf Press and the Forward Silver Literary Fiction Prize. She has received fellowships from the Guggenheim Foundation and the National Endowment for the Arts and has contributed to the New York Times, the Los Angeles Times, Elle, O, the Oprah Magazine, Granta, One Story, and the Harvard Review. She received her MFA in poetry from Columbia University and teaches at Sarah Lawrence College.